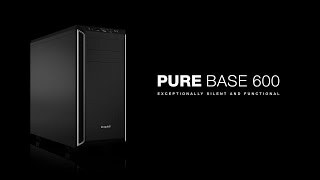 PURE BASE 600 | BLACK silent essential PC cases from be quiet! Pure Base 600 offers many possibilities for system component selection. The three HDD slots can be repositioned to allow installation of the largest of graphics cards and the ODD cage is removable for maximum flexibility of water cooling and drives. Pure Base 600 was optimized to be the perfect case for liquid cooling. Three areas are specially designed to allow them to be added: front, top and rear. All sizes of radiator up to 360mm are possible. The Pure Base 600 top cover is adjustable allowing choice between boosting your system’s cooling or silence. You can close it for more silence, open it partially for more exhaust or leave it open to mount a water cooling radiator. Whisper-quiet operation – typical for be quiet! Two pre-installed Pure Wings 2 fans with nine airflow-optimized fan blades reduce turbulence and increase air pressure: 120mm at the rear, 140mm at the front. Permits up to four additional cooling fans. Integrated 3-step fan controller supports three fans. Sound insulating material on top, side and front that dampens vibration. Filters at front and bottom prevent the dust to come into the case.